TOUR GUIDE RESPONSE: Dear Marty: Thank you so much. It is wonderful to host such well read visitors. Our 2-day tour was better than expected. Tatiana was punctual, gracious, efficient and an extraordinarily good guide. The tour she conducted at The Hermitage was excellent: she was not only an expert on the art work but was also able to avoid the crowds enhancing our ability to spend some time with the pieces she described. Because of her organized approach to the tour we were able to see many more of the wonderful sites in St. Petersburg than we could have on our own. The food was good, too. Tatiana is an excellent guide. My wife and I were especially interested in seeing the Hermitage in more depth than we were able to do some years ago during a large group tour. Tatiana is an art historian who provided us with insightful commentary on the works of art we viewed during a much more extended tour of the museum than we previously had. She also tailored our tour to include places that we had not previously visited. We highly recommend Tatiana. TOUR GUIDE RESPONSE: Thank you. You are both very special travelers. We were a family of 5 traveling to SP and had the pleasure of experiencing the beauty of SP with Tatiana.She was simply an amazing guide.A true "local" who really knows and loves her city.Our daughter had studied the siege of Leningrad, so Tatiana made sure to give her explanations with this in mind. Truly an engaging experience.We were privileged to have her arrange a visit to the Hermitage before it opens to the public, so that we could experience the beauty & austerity of the palace without crowds. TOUR GUIDE RESPONSE: Dear Nisha, thank you. It was a pleasure to meet you and your family. We are so glad that we chose Tours by Locals to show us St Petersburg. Our guide made the most of our time here by gaining early entry into museums. Her knowledge of art history was shared and made the experience more meaningful. Everything was perfect, and I would have to say it was the vacation of a lifetime. Tatiana's love of Russia and her vast personal experience enabled us to appreciate and see all the highlights of St. Petersburg. Thank you so very much for having arranged the magnificent trip we took!! An extraordinay tour with an exceptionally outstanding guide. If you are going to St. Petersburg, this tour with Tatiana as your guide, should be your only choice. In all of our tours with ToursByLocals, she has been the most engaging, knowledgeable, prepared and accommodating guide. It just doesn't get any better. The tour schedule covers a lot of ground historically and the Hermitage is a must. Tatiana can provide ALL the details. You are missing out if you pass on this tour. TOUR GUIDE RESPONSE: Thank you so much. I was inspired by you! Hope to see you again in our amazing city! I was a little nervous about going into St. Petersburg and having the proper paper work but Tatiana provided that to me by email prior to our arrival which made entrance into Russia so easy! We spent 2 full days with her and her driver. I could not even begin to express how pleased we were! She grew up there so her knowledge base of the history of Russia was superb! She is also immersed in the arts and her love for that shows throughout her tours. Two delightful days which we will not likely forget! TOUR GUIDE RESPONSE: Thank you! Best from St.Petersburg! Tatiana was amazing! Her knowledge and experiences were vast and she expressed them in a wonderful and fun way. We had a remarkable day with her. Thank you so much for a great tour. Smooth, efficient arrangements by e-mail beforehand. Comfortable air conditioned 8-seater for journey with fascinating info about everything we saw. Tatiana is personable, has a love and deep knowledge of art history, and shares it generously with a good command of English. We opted for the Diamond Room at her recommendation which was spot on. Lead by a curator of the rooms - also fascinating and knowledgable. Ended with viewing of sumptuous apartments in palace. My wife Cathy and I spent three days with Tatiana touring St. Petersburg. We enjoyed our tours very much - to the point, efficient, yet very detailed descriptions from somebody who knows her art history very well. We rate her as a 5/5. Tatiana was fantastic and so was St. Petersburg! It was s lot in two days but somehow we got it all in. You just cannot do it in a large group...and a bus cannot get as close as our wonderful driver did! Perfect tour. TOUR GUIDE RESPONSE: Thank you. You are great travelers. TOUR GUIDE RESPONSE: Thank you Daniel! Tatiana was a wonderful guide as she took us through the more important areas of the Hermitage (and yet we could have spent 2 more days there). She was very knowledgeable, and we were very happy to have used her guide services. TOUR GUIDE RESPONSE: Thank you for the comment. It is very important. Tatiana was wonderful! She was knowledgeable, friendly, flexible about our schedule, helpful in a new country where we were unfamiliar with local custom, etc. Highly Recommended!!! TOUR GUIDE RESPONSE: Thank you Daren! We could not recommend our guide, Tatiana, more highly. We were lucky to have her and she made our visit to St Petersburg a great pleasure and unforgettable. Charming and generous with her knowledge. TOUR GUIDE RESPONSE: Thank you! It is a pleasure to meet so intelligent and knowlagable people! Visiting The Hermitage with an art historian with Tatiana's vast knowledge was a treat. Yes, she knows the art but her narrative about the vast palaces that house the unending collections was fascinating. This isn't just a big museum. It is a collection of palaces built over a 100+ year span and Tatiana placed all of it in historical and cultural context that made it come to life. We had a fabulous day with Tatiana and her husband Nicky who served as driver. Tatiana comes highly recommended. The Perfect Tour Tatiana welcomed us like old friends and after her delightful touring, dropped us off at the hotel door. It was like waving goodbye to family. With absolutely no connection to Russia and very little previous knowledge of the city, this was our intent - to understand the city at a local level and gain a more intimate perspective. Thank you Tania for sharing the day with us! I highly recommend booking a tour with Tanja! She was absolutely wonderful. She is very knowledgeable about Saint Petersburg and its history, about its museums, palaces ... During this three days tour she took us to see all the really important places. She is kind and friendly so the whole time we felt like a friend taking us for walk around her city. It was a really great. Tatiana was an absolute professional as well having a wonderfull engaging personality. Extremely knowledgeable about every aspect of St Petersburg. We could not have wished for anything more, we were all very impressed, very happy and extremely satisfied with our tours. Tatiana was a joy to be with, how lucky we were to have chosen her to show us the beautifull city of St Petersburg. All our expectations were met and more. Thank you Tatiana. The tour was everything promised and succeeded in getting the most out of our two days in St. Petersburg. It was very helpful to travel with someone knowledgeable about the art and architecture we were looking at, rather then simply running off a series of memorized dates, and Tatiana's tour added considerably to our enjoyment and understanding of the city. If you want a tour with depth, this is the right one. Tatiana is wonderful. She is very much involved in the arts in St. Petersburg, so she not only knows what you are seeing, but often has interesting inside stories to boot. She also knows her way around so that in particularly crowded places we were able to save time in many instances (although some are just unavoidable). Tatiana is also a very proud Russian and we appreciated her personal insights and stories, which put much of what we saw into context. You won't find a more knowledgeable guid. We had a fabulous 2 days in Saint Petersburg with Tonya. She was very able to share her insights knowledge and love of her country with us. She was able to share her art history understanding with us at the Hermitage museum and at the other Palaces that we went to. The 2 days there were packed full of history culture palaces and Russian daily life. We all enjoyed our time there very much and Tonya was a big part of that. We could not of had a better guide. Thank you very much. Tatiana was a fantastic guide. She has a wealth of knowledge regarding Russian history and is well connected to museum curators. She was very organized and arranged an exceptional experience. We were very pleased and would highly recommend her. Tatiana was an exceptional guide with a thorough knowledge of the history, culture and art of the wonderful attractions of St Petersburg. Her two day tour covered most of the major places of interest which she introduced to us and presented to us in an interesting and informative manner. I would thoroughly recommend her tour to any educated visitor to St Petersburg looking for the best experience of St Petersburg. TOUR GUIDE RESPONSE: Dear Kathryn: Thank you so much for warm words and recommendation. Tatiana was amazing. She really knows her history and set up an absolutely fantastic tour. She was waiting just outside the immigration hall both days when we arrived. She had set up a wonderful van and driver just for the 4 of us. She was able to answer every question we presented her. We wasted absolutely no time in lines with the cruise ship tours. Tatiana also made arrangements for lunch both days. If you are going to have lunch one day have her make arrangements for Entree. It was delicious. We highly recommend Tatiana. She guided us through St. Petersburg for 2 days. She has unparalleled expertise in the history of St. Petersburg, and specifically the museums, palaces and churches. Tatiana personally knows the Hermitage inside and out as she was a special events guide there. She enabled us to learn, see and do so very much in such a short time, including giving us a great introduction to the local ambiance and culture. Tatiana is terrific!! Bright, personable, witty, knowledgeable, sensitive and delightful! Tatiana's knowledge of the architecture, works of art and her love of St. Petersburg shone through and inspired us to double the time of our tour and extend into further days. Your time spent with Tatiana will enrich your knowledge not only of the culture and art of this incredible city, but also of your experience of life as a whole! Tatiana is one of the best tour guides I have had the pleasure to meet. She is passionate about St. Petersburg. Her understanding and detail of the history of the city and Russia is truly remarkable. I have covered with her all of the major museums, churches, palaces, theaters and landmarks. She has exposed to me the true Russian culture and love of life here. I can highly recommend her! My experience here in St. Petersburg has been the most valuable experience of my life because of Tatiana. TOUR GUIDE RESPONSE: Dear Mr.Chenoweth: Thank you for the comment and recommendation. It was a real pleasure to meet you and to host you in St.Petersburg. Thank you for your passion to the Russian culture! Tatiana is an outstanding tour guide. Not only knowledgeable and enthusiastic about art and all things Russian, she gives of her own personal experience and engaged directly with us so that we learnt a huge amount above and beyond what was advertised (tour of the Hermitage). Absolutely worthwhile getting early entry and a guide. The museum is VAST and labrynthine so impossible to navigate intelligently without guidance. Tatiana tailored the tour to our interests. HIGHLY RECOMMEND, NO RESERVATIONS! 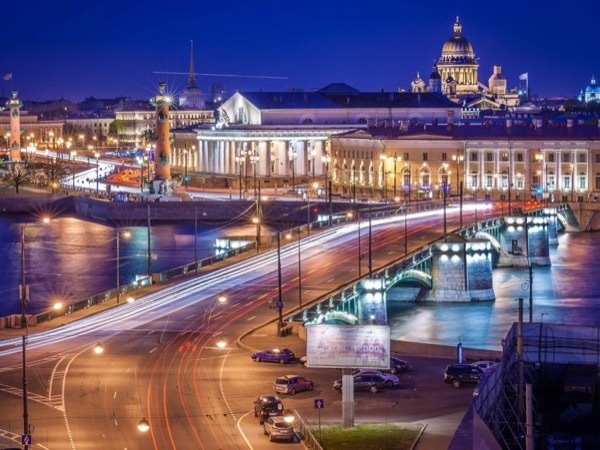 Tatiana is very knowledgeable and exceptionally passionate about Saint Petersburg, her home city. She met us by Alexander's column at Hermitage; on time and with pre-arranged tickets for entry at 9:35 am. We had a near 'private showing' of the Hermitage as we were amongst the first to enter the museum. Tatiana went through the details of several paintings and exhibits and it was fascinating to hear her explain. Highly recommended. Tatiana was amazing! She is an expert in art and architecture, and it was evident in all that she said and did. If we ever return to St. Petersburg, we will only go if we can have her for a tour guide. I cannot believe she was able to show us so much of the art and beauty of the city. She made it come alive!!! Thanks, Tatiana! Tatiana has such a deep understanding of St. Petersburg's cultural heritage. Through her wonderful insights, I have gotten a much richer appreciation for the artists, authors, and architects who contributed to the elegance and beauty of St. Petersburg. I have also gained a richer appreciation for both Russia and its people...something that could not be achieved on a city coach tour. Thank you , Tatiana. Nothing can prepare you for the overwhelming beauty of the restoration at Peterhof and the other Tsars' palaces. Tatiana made it a wonderful day. Tatiana was the best guide - her knowledge of the artistic treasures of St Petersburg was encyclopaedic but she always checked to see how much we wanted to know and the speed at which we wanted to go through various galleries, allowing us to concentrate on periods we most admired. A joy of a day. If you want to know Hermitage Museum and Saint Petersburg do not hesitate: Contact Tatiana. I, my wife and my daughter had a great experience with her in Hermitage Museum. We were very sad to stay only one day in Saint Petersburg. Tatiana is a high quality guide, with an easy communication and has a deep understanding of the culture of The Russia Empire. We really thanks for this unique opportunity. TOUR GUIDE RESPONSE: Dear Mr.Rahme: It was my pleasure to spend a day with you and your family. Since I day is of course not enough to see St.Petersburg I look forward to meet you here again to see the other wonderful sights you missed. Thank you for the nice comment. Tatiana is so knowledgeable about the history and architecture of the Hermitage buildings and in particular about the great works of art it contains but more importantly she conveys that knowledge with great clarity and enthusiasm during her tour. If you really want to understand the Hermitage, then you can do no better than Tatiana as your guide. She will adapt the tour to your needs and pace and the early entry offered on her tour is a great bonus as well. TOUR GUIDE RESPONSE: Dear Mr.Safell: Thank you so much for the warm words and high evaluation of my tour. Hope you enjoyed the rest of your stay in St.Petersburg. Tatiana expertly arranged a short tour to Peterhof according to our interest in seeing "artistically significant" aspects of some of the buildings. She told us a lot about the history of Peterhof in a short time. We found her to be truly an expert in her field. We also appreciated easy meeting instructions as we were having a little trouble getting around Saint Petersburg. We highly recommend her as a guide and wish we had had time to do another tour with her. In a word, "Perfect". In more detail... Tatiana was knowledgeable, accommodating, helpful, had great recommendations for fine dining, etc., etc. We could not have chosen a better guide to help us see and understand St. Petersburg. Tatiana is an excellent guide, one of the very best. Her extensive knowledge of history, art, and architecture is remarkable, as is her store of fascinating details about historical figures. She was able to arrange an amazing backstage tour of the Mariinsky Theatre, and her own quite expert tour of the Hermitage (she seems to know every inch) included a special tour of the Gold Storage. Her charming personality and her willingness to tailor her tour to our interests made our 2 days with her very special. Tatiana is a great tour guide. Arista! The very best! Tatiana is a wonderful person and we feel blessed that she was available to show us the beautiful city, culture and history of St Petersburg. She represents the best of Russia, aristocratic and passionate about an amazing country and culture. If you are rich and famous, or just very lucky, Tatiana is the perfect person to make your visit exceptional! спасибо! Вы самые лучшие! spasibo! Vy samyye luchshiye! "Thank you! You are the very best, Tatiana! Our guide Tatiana was very knowledgable, pleasant and accommodating. She was a wealth of Russian history and art history. Our two day tour was tailored to our interests and Tatiana made art and history come alive for us. She arranged early entrance to the Hermitage and scheduled our tour stops to avoid crowds whenever possible. We were very pleased with our driver, the van with AC and the restaurants chosen for our lunches. We feel especially fortunate to have found Tatiana. She shares her wealth of knowledge about Russian history, art, architecture, music and literature in a way that is compelling and inspiring. She is a marvelous ambassador for your country, passionate, articulate and delightful! Tatiana really made my day - very knowledgeable about both art and history. Spent a fabulous extended morning seeing so much more at the Hermitage complex than if I'd just pottered around on my own. Tatiana's knowledge of St Petersburg is really astounding. She is passionate about her city and in particular the Hermitage. She was really comfortable to be with was a terrific guide. I would recommend her without hesitation to anyone visiting St Petersburg and wanting to know more of the city and its history.